Belkin on Thursday introduced its new GoStudio, coming in September for $119.99. It’s an accessory kit that turns an iPod into an audio recording studio. 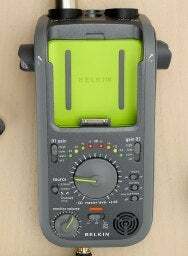 The Belkin GoStudio turns an iPod into a portable recording studio suitable for lectures, interviews, podcasts or live music recording. The GoStudio lets you record audio — podcast episodes, interviews, lecture, music or short clips, whatever you want — directly onto your iPod. Your iPod can synchronize the content with your Mac once it’s connected, then you can upload that audio to your blog, Web site, Facebook page or MySpace pages. The GoStudio features a dock connector and sleeve to let you slide in your iPod — it’s compatible with the iPod classic, fifth-generation iPod and iPod nano second and third-generation models. The device lets you record to your iPod in 16-bit, 44kHz digital audio, and you can play back recordings either directly through the iPod or through the GoStudio’s built-in speaker. The GoStudio sports two combo microphone inputs (XLR and quarter-inch), along with a 3.5mm mini-jack microphone input. It also includes two built-in omnidirectional stereo microphones, master level control, direct monitor volume control and a tripod mount. Belkin’s Web site had not been updated with information about the GoStudio as Macworld posted this article.